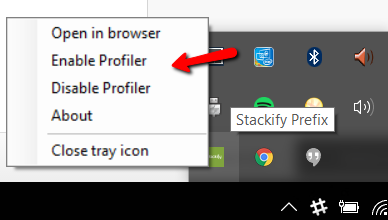 From the tray app, right click on it and click "Disable Profiler" then "Enable Profiler" once it stops. Debug your application as normal. If that process doesn't work, please read below. To verify that the profiler is working, browse on your PC to c:\Program Files (x86)\Stackify\Prefix\Profiles and see if any folders exist. The folders will have numeric names. If folders exist and data is inside of these folders, the profiler is working. If you are using IIS Express and there is no profiler output, you may just need to restart Visual Studio. Restart and then create some web requests to IIS Express and see if profiler output now exists. Enabling the profiler should set all the appropriate environment variables and settings for IIS, as well as restarting IIS. Try enabling the profiler again from the Prefix app and stopping then restarting WAS and W3SVC windows services on your PC. From command line perform “net stop was /y” and then “net start w3svc”. With IIS Express you need to enable the Stackify HTTP Module in your app for all web request types to be supported. Please see this help doc about configuring IIS Express & Visual Studio 2015. It is possible that the Prefix Windows service is getting some sort of error processing the profiler output of your application. Review c:\Program Files (x86)\Stackify\Prefix\stackify.log for exceptions and please contact Stackify support if it seems to be stuck processing a certain request and throwing exceptions. Be sure to send the log file to support.